That path won elBulli a slew of accolades (in addition to earning three Michelin stars, the restaurant would be named best in the world an unprecedented five times) and turned its 8,000 reservations into a prize for which a million people competed each year. It also, on occasion, earned scorn from critics who lambasted elBulli for what they perceived as its excess, its elitism, its use of chemicals and its unwillingness to serve what they considered "real" food. Especially in the past few months, as news about Adrià became an almost daily media feature and numerous journalists, bloggers and ordinary foodies took to publishing accounts of their meals (Slate dubbed the genre IAAEB: "I Ate At El Bulli"), a backlash began to form. But on the last night, all that was forgotten. The kitchen was a scene of barely controlled chaos, as the normal staff of 45 was joined by the dozen or so illustrious alumni present at the morning press conference. Together they turned out a 50-course menu that included many of elBulli's greatest hits, such as a hot-and-cold Gin Fizz and a floral paper made from pressed cotton candy, along with one infamously reviled dish called Smoke Foam. The last taste of the night was Adrià's take on a Peach Melba, a recipe invented by Auguste Escoffier, the father of modern restaurant cuisine, who was born in 1846. That just happens to be the number of dishes that Adrià and his chefs have invented since they began experimenting with cuisine. As the final serving went out and the kitchen exploded with cheers, Adrià fiercely embraced each member of his permanent staff. Many of them have worked at elBulli for well over a decade, and most of them will continue on  after a brief vacation  at the foundation. 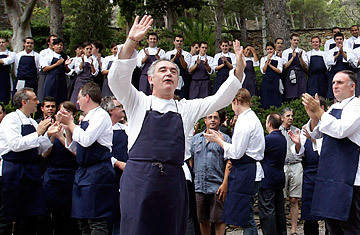 That night, the wives and children of men who started at elBulli when they were in their teens joined the 35 young apprentices who had just finished up six months or a year of hard labor in a joyous outdoor party. Juli Soler, the restaurant's co-owner and the man who originally hired Adrià, was there blasting the Rolling Stones and encouraging everyone to dance. There would be cake and cocktails, and Adrià himself dressed in board shorts, encouraging everyone to run down to the beach for a dip. The party lasted nearly until dawn. Amid the revelry, a few partygoers couldn't help but feel nostalgic. Andoni Luis Aduriz, who worked at elBulli for two years in the 1990s before starting his own highly acclaimed restaurant, Mugaritz, was melancholy as he sipped a gin and tonic. "This place was so important to who I became as a chef and as a person," he admitted. "It's hard to let it go." His words offered a poignant reminder that for all the singularity of Adrià's vision and accomplishment, elBulli was also and always a family. Like other restaurants, it was subject to both cohesion and rivalry, complaints and praise, and many of its most illustrious members flew far from the nest. But together, they managed to take a beachfront grill shack on a hidden cay in northeastern Spain and turn it, for a moment, into the center of the culinary world. See "Ferran Adrià at Harvard: The Top Chef and the Scientists." See pictures of a day's worth of food around the world.